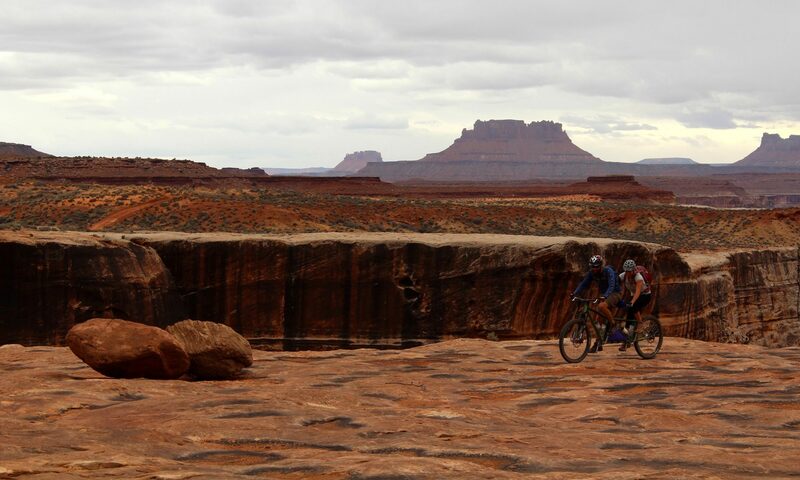 When Hayley and I got invited on a 3-day White Rim trip set for early March, we both had the same thought: Tandem! The White Rim is the perfect trip for a tandem team, and since it can be done with sag wagons (like our trip was) it’s a great multi day experience if you don’t want to carry tons of gear and water. This was actually my first bike trip with sag wagons, so that was a pretty awesome experience. It’s like a river trip with bikes! This was our first multi day trip on the T-Rex, and we were both excited to see what a ride like this would be like on a tandem. We’ve ridden quite a bit of singletrack around Durango on it, but the White Rim offers other unique terrain, like super steep dirt roads and sand. We were doing the route counter-clockwise, so our first morning started with flying down Mineral Bottom road at top speed. Nothing like two people on a bike to get it really moving. The road was in good shape, and we had a blast bombing down it. We reached the big switchbacks that bring you down to river level, and I contemplated the amount of energy our brakes were going to have to absorb. Since this was our first big decent on the BB-7 brakes, I rode the brakes and we went down pretty slowly. About halfway down we stopped for a second, and realized we could smell our brake pads. We took a short break to let our cooked calipers cool down, and we were back on our way. Once down by the Green river, we got our first taste of sand on a tandem. I’d built our T-Rex up with 30mm wide Velocity Cliffhanger rims and put some beefy 2.4 Chunky Monkey tires on those. The wheels looked and felt huge, but they felt appropriate for the bike. The whole setup did amazingly well in sand! We were able to ride anything any of the single bikes could ride. The long wheelbase was extra stable when the front wheel would get pushed around in soft patches, and I was actually able to correct a lot easier than on my single bike. It was totally unexpected, but also very welcome, since there was a lot of sand on this trip. The steep hills are also interesting. The thing about riding a tandem is that you cannot fall over backwards, and you cannot endo. This basically means unlimited traction on climbs, all while pedaling seated. This was a welcome feature on the White Rim’s numerous steep hills. Quite a few aren’t longer than a few hundred yards, but they certainly get steep enough that you notice them. Going down is a whole other story. You can’t endo, but you can get the front tire to break loose if you hork down on the brake too hard. Once again, all while seated. Hayley joked it was the only time she could see (right over my head) where we were going. At one point, we came around a corner and found a few of our friends stopped, staring out at the breathtaking landscape. Our friend turned to us and said “We can’t gape and ride at the same time.” Hayley simply said “I can!” as we rode by. Our weather was pretty nice for being early March. We did get a massive rain and wind storm on our second night, but we ended up waiting until about noon to start riding the next day, and the road had dried out pretty well. I really liked doing this at this time of year. We came across very few other groups of people, many of them doing self-supported trips. Overall the tandem did absolutely fantastic out there. We thought it was a great option for doing the white rim on, and Hayley really liked being able to look around so much on a trip this scenic. It also worked out that a friend came on the trip who had never mountain biked before. She borrowed Hayley’s hardtail for the trip, since we were occupied on the T-Rex. Myth Cycles. Go take a ride with a good friend. All pictures were taken by the extremely talented Peter Julien-Sehl. He doesn’t have a professional site yet, but as soon as he does, I’ll be linking it here.